Lucy S. Dawidowicz, was a scholar of Jewish life and history whose book The War Against the Jews is widely regarded as a pioneering study of the Nazi genocide. Mrs. Dawidowicz, the daughter of Polish immigrants, was at the center of the study of the modern Jewish experience at Yeshiva University, where she held a chair in interdisciplinary Holocaust studies. Early in her career, in the immediate aftermath of World War II, she went to Europe, where she helped Jewish survivors of the war to re-create schools and libraries, and she recovered vast collections of books seized by the Nazis. Her major work, The War Against the Jews, postulates that the destruction of the Jews was a central and inescapable element in Nazi ideology and was always a principle war aim of Hitler, just as important as his military conquest of Europe. In this view, she conflicted with other historians, who believed that the Holocaust was not a necessary part of the Nazi program but evolved in response to such circumstances as the defeats on the Eastern front. 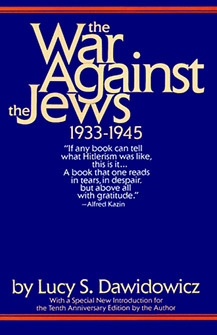 The War Against the Jews was called “a work of high scholarship and profound moral import” by Irving Howe, in his review in the New York Times Book Review. It is marked above all by its sobriety. Mrs. Dawidowicz allows the coolly accumulated weight of detail -- the growing force of the Nazi’s anti-Semitic juggernaut, the evolution of the camps as places of scientific murder, the efforts by the victims to hold onto fragments of normal life -- to create its emotional and intellectual impact. Mrs. Dawidowicz refused to judge the failure of the Jews themselves to mount a more active resistance to the genocide, and in this she clashed bitterly with a number of other historians. Her belief was twofold. First, she felt it morally inappropriate for those who did not face the persecutions themselves to criticize the behavior of those who did. Second, she felt that in any case, Jewish resistance was doomed to failure. Given the Jews’ isolation, their lack of arms and the overwhelming material superiority of their enemies, there was virtually nothing they could have done to alter their fate, she wrote.